Most Thanksgiving tables will be stocked with one or more of the following: pumpkin pie, pecan pie, or apple pie. 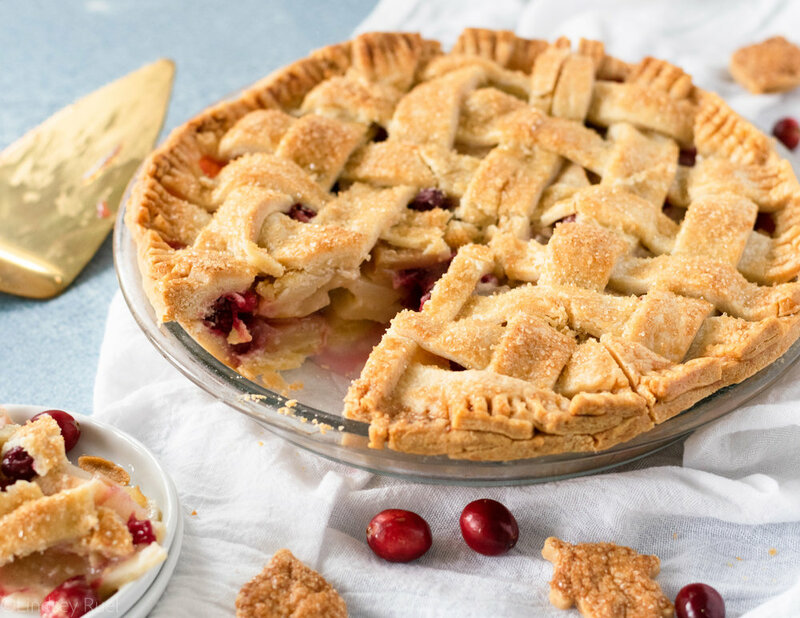 Don’t get me wrong, those are some mighty fine choices, but why not mix things up a bit with a cranberry pear pie? It’s almost like an apple pie, but much more interesting and just a delicious! I personally love pears and they are wonderful in pie form. But because they are a bit sweeter and more mild, the addition of cranberries is a must! They provide that tang tho really balance out the pears. The fresh ginger doesn’t hurt either! 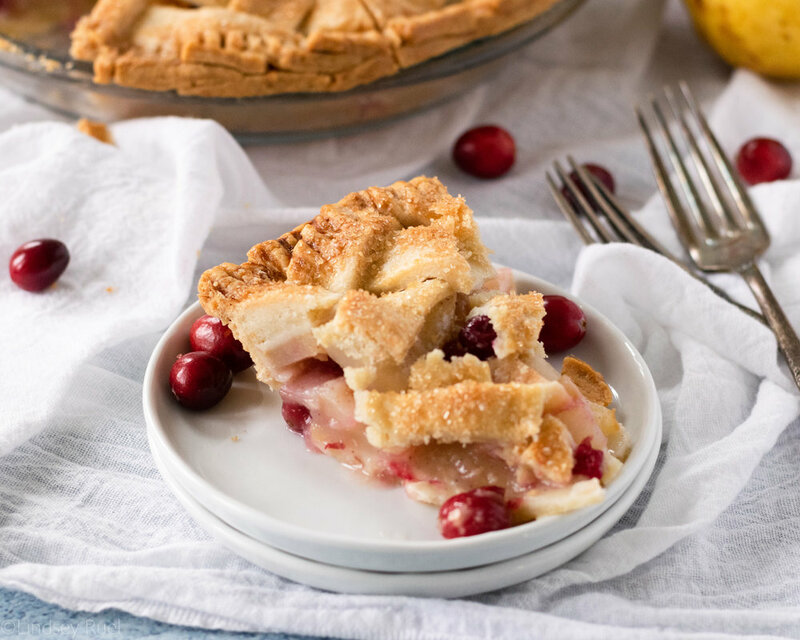 The best part, this pie is so darn easy to make, especially if you use a store bough pie crust. There is no mixing, no boiling, basically no extra bowls needed. Start with some sliced pears, about 3 to be exact. I like to toss mine in a bit of lemon juice (or orange juice) to keep them from browning while I prep everything else. You will also want to have your cranberries rinsed and dried. In a small bowl mix together flour, sugar, fresh grated ginger, cinnamon, and salt. Working in layers, start by spreading out a layer of pears then topping with a handful of cranberries. Sprinkle the flour/sugar mixture generously over top. Repeat these steps at least two more times until all the pears are piled in the pie crust. After the last layer of flour/sugar is sprinkled on, scatter small cubes of butter around the top. Add the second pie crust on top in whichever pattern you like. I personally love the classic lattice weave pie crust. However you choose to adorn your pie, be sure to brush it with a little egg wash (egg + water) before baking so that the crust gets nice and brown. Bake for about 40 minutes until the crust is nice and golden brown. The pears and cranberries will be nice and tender on the inside, coated in a sweet ginger-cinnamon glaze. The pie is definitely best eaten a bit warm, maybe with a side of vanilla ice cream, but it is much easier to cut with it has cooled to room temperature. That is if you care about having the perfect looking slice, which you may not since you probably aren’t taking photos of your pie to post on the internet. In that case, just wait until it’s cooled enough to handle, then dig right in! Roll out half of the pie dough to a circle slightly larger than the pie dish. Transfer the pie dough do the pie dish and press into the bottom and sides of the pan. 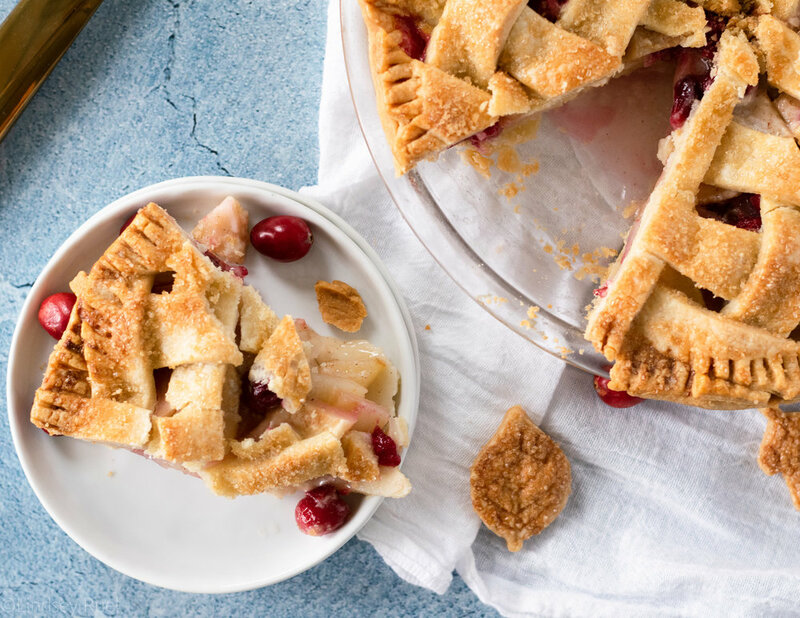 Cut off any overhanging pieces of pie dough. Toss pear slices in the lemon and orange juice immediately after cutting them to prevent them from discoloration. In a separate bowl, mix together sugar, flour, corn starch, ginger, and cinnamon. Sprinkle about 1-2 tbsp of the flour mixture onto the bottom of the pie. Arrange about a third of the pear slices on top, then scatter a small handful of cranberries on top. Sprinkle 1-2 tbsp of the flour mixture over the pears and cranberries. 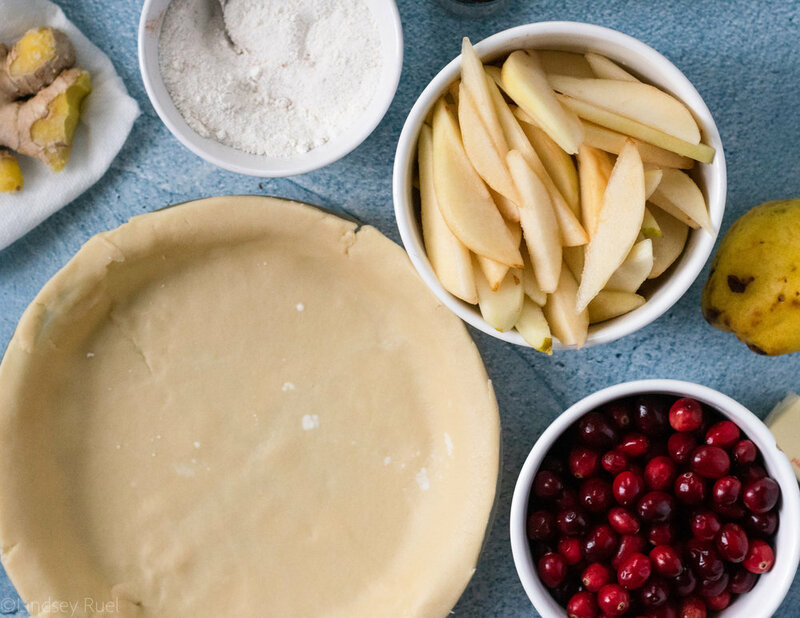 Repeat the previous step with the pears, cranberries, and flour mixture until all the pears are in the pie. Add small cubes of butter around the top of the final layer of flour and sugar. Roll out the remaining pie dough. Arrange the top layer of pie dough on top of the pie in your desired design. Crimp the bottom and top pie dough layers together. Brush with an egg wash (1 egg mixed with 1 tbsp water), then bake for 40-45 minutes, or until the pie crust is golden brown. Let the pie cool for at least 20 minutes before serving.